When I was in the fifth grade my friends and I watched Commando starring Arnold Schwarzenegger. In that film, Jenny Matrix (Alyssa Milano) is kidnapped by a South American crime syndicate. Luckily, her father, Ahhnold, happens to be the human equivalent of Voltron and spends three quarters of the movie blowing basketball-sized holes through the afore-mentioned kidnappers. When the movie was finished, my friends walked away feeling smug that they had just seen something their parents wouldn't let them watch in a million years. I on the other hand, had nightmares for weeks about being kidnapped. Never mind that the only thing I owned that could even remotely be used for ransom were my Star Wars bed sheets, the fear remained. Today, I'm a little older, a little wiser, and little less scared of being kidnapped. That said, The Bunker Diary made the skin crawl off my bones. The story opens with Linus, a sixteen year-old dropout living on the streets, busking and scouring train stations for spare change and food. One day, he comes across a man he believes to be blind. Offering to assist the man with his luggage, Linus is knocked unconscious and thrown into the back of a van. Hours later he wakes up in what appears to be an abandoned bunker. The first thing Linus notices is that there are no windows or doors. He is alone, but sees that there are six rooms in the bunker. There is also a kitchen, a bathroom and an elevator. The catch is he can't operate the elevator from his end. It goes up and down as if on a timer, usually it comes back down empty. Usually. 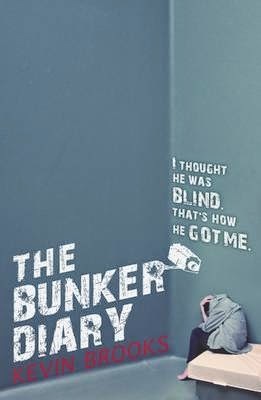 The Bunker Diary is a disturbing albeit (for me) frustrating account of what happens when you throw a group of random strangers into an underground prison. It's like taking The Real Word and Saw and throwing them into a wood chipper. None of the victims can properly describe the person who abducted them; they don't know why they have been targeted or where they are. Linus soon realizes that there doesn't appear to be any rhyme or reason why they've been chosen. The bunker is covered with security cameras and any attempt to disable them is met with harsh punishment. There is little to no communication with their abductor; there are no demands, yet they know they are being watched and closely monitored. What is going on? Who is this guy? What does he want? Where the hell are they? Why am I shouting at my laptop? These are the questions that make The Bunker Diary almost impossible to put down. Kevin Brooks hits the ground running and doesn't stop until you have been properly beaten into submission. So effective is the tension that I had to read this novel in one sitting. Sure, I was given flack at the jazzercise session I was leading but that's the price you pay for loving literature. You know the old saying: Books Before Looks. I was completely obsessed with getting to the end and finding out who it was lurking above them, which of the victims would snap first (and man, do they snap) and how they would try to escape. I won't give away the ending. I'll let you get there on your own, but I'd love to hear your take on it. Good luck! "It's like taking The Real Word and Saw and throwing them into a wood chipper." Thank you for the nightmares before I've even read the book. If I read this, I will never sleep again. It sounds AWESOME. Also, "Books Before Looks" I think I need on a t-shirt. Or a tattoo.